What if Shakespeare was illiterate? What if someone else wrote his plays? What if that person was writing them with political intentions, using theater to turn the people against his enemies? 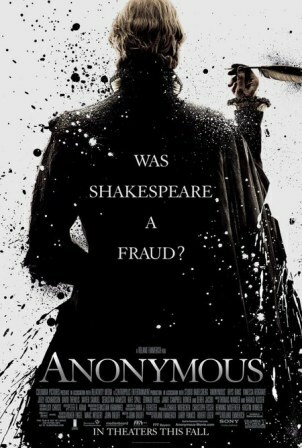 All of these questions are tackled in Roland Emmerich’s latest blockbuster Anonymous which explores the theory that the Earl of Oxford was accountable for all of the Bard’s works. Unlike some of Emmerich’s past work, Anonymous is really a character driven piece with the focus on the actors rather than the special effects. Despite this he really brings a sense of the grandiose to the film with huge establishing shots of Elizabethan London and well choreographed action scenes which never over step the mark like recent period actioner The Three Musketeers did. The cast is a real who’s who of great British actors, all of which seem to be relishing their roles. Rhys Ifans really carries the film as the Earl of Oxford, creating a character whom is both excessive but credible. 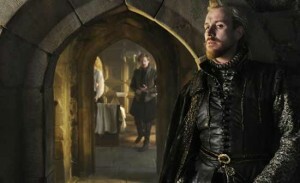 Also great are David Thewlis and Edward Hogg who play his rivals. Edward Hogg particularly stands out, creating a villain so wicked he feels like he’s sprung straight from a pantomime and very different to the meek character he played in Bunny and The Bull. The really interesting characters however are Elizabeth I and William Shakespeare, both of whom are not portrayed in a typical fashion. Rafe Spall clearly is loving every second as William Shakespeare, playing him as an undignified and outrageous drunk. Elisabeth I is also far from the reserved character history told of, taking on numerous lovers and having numerous secret children. All of these performances add to the fun of Anonymous which is so melodramatic it feels as if it could be one of Shakespeare’s works. Anyone expecting this to be a plain period drama will be disappointed, as Emmerich has crafted a riveting political thriller with the source material. Assassination attempts are botched, campaigns are mounted and enemies are quashed, as the Earl of Oxford works to gain revenge on the Cecil family. The only real fault with Anonymous is its length. Despite starting off at a good pace the last 30 minutes seem uneven and it could have ended at several points. The other issue is that there seems to be way too many plot lines going on at once, which are in themselves very interesting but all thrown together gets a bit too much. There certainly is a great TV series to be made out of the source material. Overall Anonymous is a highly entertaining 130 minutes, which boasts one of the best British casts since Harry Potter. Anyone with even a passing interest in Shakespeare is sure to gain something from it. Win Everything Must Go on Blu-ray! Read a biography of Cecil- or Walsingham- to see how long ANYONE ploting against Cecil would have lasted. This directot and all the Oxfordians need to get a life. My professional life is entirely based around Shakespeare, and the one thing I get from the merest IDEA of this film is high blood pressure. The plot is ridiculous, as is the basic premise behind the film.